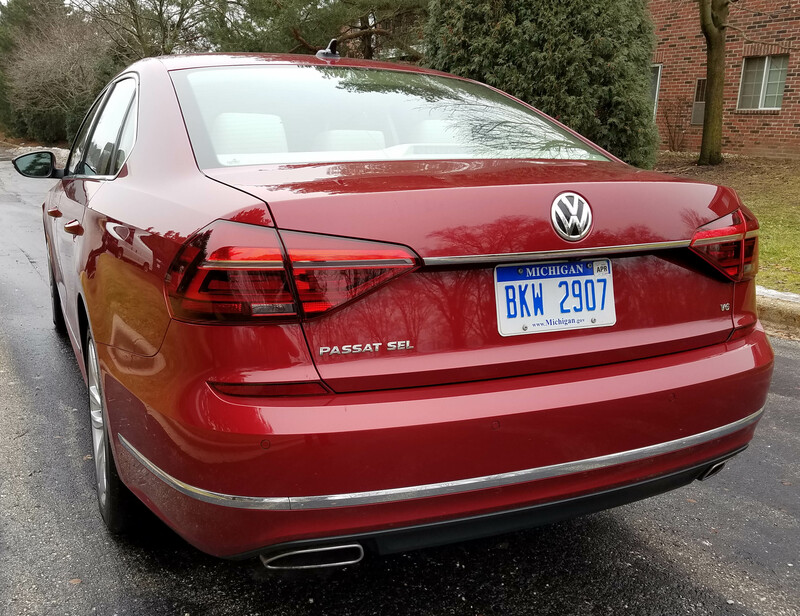 It may be a bit early in the calendar year to talk about hitting for the cycle, but the 2017 Volkswagen Passat does just that. Rare is the mid-size car that delivers healthy power, refined handling and ride along with a quiet interior. Often a sedan with respectable power is noisy inside, or rides like a buckboard. 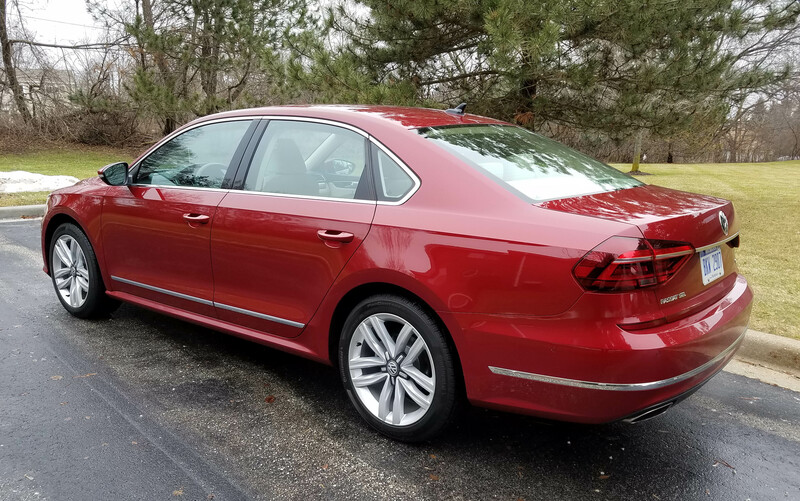 But the Passat is a pleasant blend that retains its sporty characteristics while delivering the “dreaded” practicality of room for five adults and their luggage, while also being a delight to drive and competitively priced. Its one drawback through the years (the car was redesigned for the 2016), has been reliability. The old model had issues. Time will tell if that monkey is off VW’s back for Passat, which is made in Tennessee. From a driving standpoint I haven’t driven a more pleasurable mid-size car in ages. 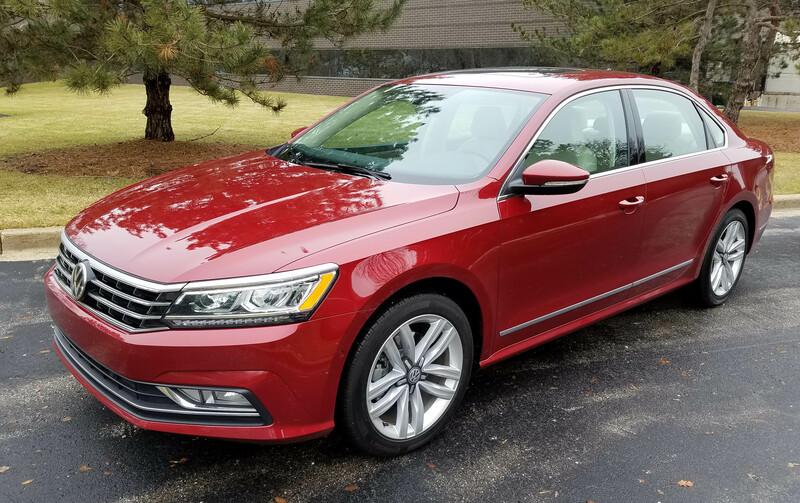 First, this pretty “Fortana Red” test car was the SEL Premium model with VW’s romping V6, a 3.6-liter number that creates a kickin’ 280 horses and 258 lb.-ft. of torque. Coupled with a 6-speed automatic the power comes on in a hurry and gives the front-drive Passat major power. Better yet, that power is smooth, not a burst as with the standard engine, a 1.8-liter turbocharged I4 that makes 170 horses. You’ll drink more gas with the V6, 20/28 mpg vs. 23/34 mpg for the I4. But I still got 23 mpg in a mix of driving that leaned more toward city speeds. Handling is fluid with good feedback to the driver, again delivering a smooth feel but with enough responsiveness to feel sporty. Ride is equally controlled and smooth (hate to keep using the word, but it fits). Several streets I regularly drive are choppy and there are a couple sets of railroad tracks I must cross. The Passat’s 110.4-inch wheelbase and four-wheel independent suspension handle all that with ease. In the Midwest, a good suspension is becoming a quality of life issue as road maintenance continues to take a back seat to budgetary cost control. 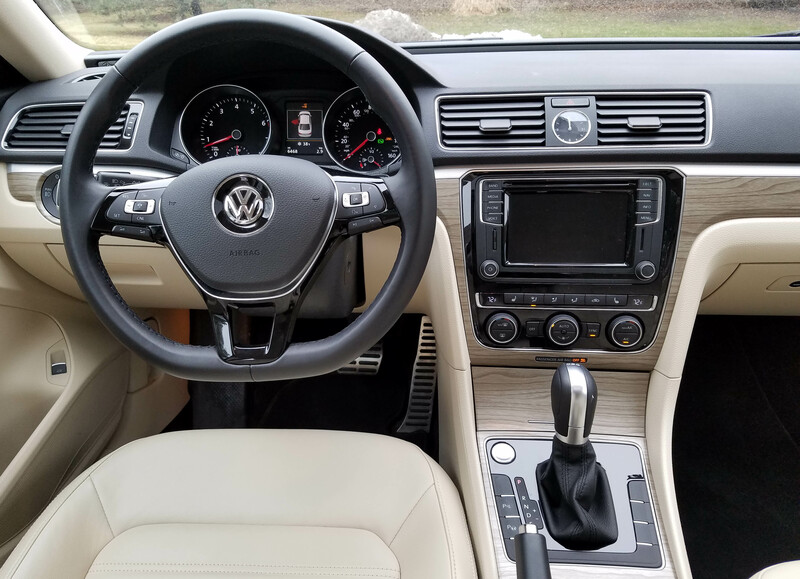 The quiet composed interior with its smartly laid out dash and comfortable well-contoured seats make the Passat easy to live with on the road, even if performance weren’t tops in your batting order. Sound deadening and the test car’s leather interior did their job of creating a pleasant environment. Dash top was black with the lower level and seats a handsome tan, plus a light tan wood-look trim on the dash and doors edged by a textured metal band. There’s a D-shaped leather-wrapped steering wheel, which means its flat on the bottom to provide the driver more knee space, not to mention create a sportier look. There also are three memory settings for the power driver’s seat and both front seats feature exceptionally good lower back and side support. The Passat’s front passenger seat is powered too and both front seats include three levels of heat. This model also features heated rear seats. Plentiful legroom and headroom in back further make this an extremely comfortable family sedan. Adding to its practicality is a 15.9-cubic foot trunk and rear seats that split and fold down. Dash controls are logically placed too. Amid dash is a smallish 6.3-inch touchscreen, but all the buttons and knobs work well and thankfully there are knobs to adjust the sound and tune the screen’s radio. The screen includes five radio preset buttons and the SEL boasts a Fender sound system with HD and satellite radio and includes a CD player. Bluetooth and a USB hookup are standard on all models. VW’s navigation system works well and is easy to see too. Below the screen are climate directional buttons and three knobs to adjust the dual climate system. In front of the driver are bright, easy-to-read gauges and the steering wheel features radio, phone and cruise control buttons. Everything is simple to understand. While overhead is a power sunroof controlled with a dial and there are three HomeLink buttons on the driver’s sun visor. Visors slide too. 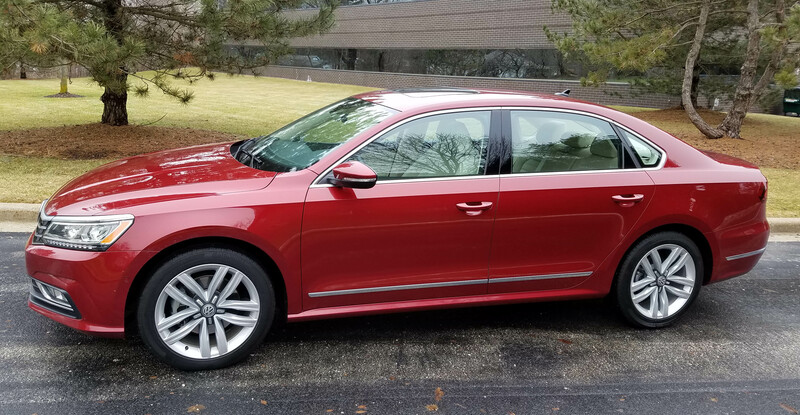 The tested Passat SEL also includes a blind-spot monitor with rear traffic alert, rearview camera, adaptive cruise control, a lane departure warning and keyless remote start. Standard on all Passats is autonomous emergency braking and forward collision warning. VW also includes Apple CarPlay and Android Auto to help drivers link their cell phones to the car. 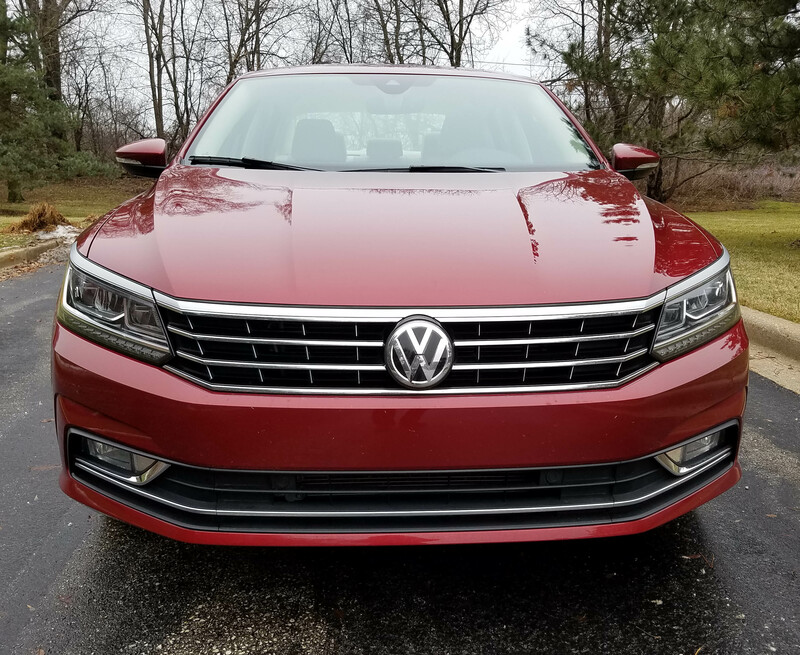 For 2016 the Passat got a facelift with slim headlights and more sculpted hood to give it a fresher, if not ground-breaking, look. The look is subdued and pleasant. If the driving experience is more vital to you than all the bells and whistles, then look to the bargain base S model that starts at $23,260 and features the 1.8-liter I4 and a six-speed automatic. Even the S comes with dual climate controls, a rearview camera and smaller 5-inch touchscreen. 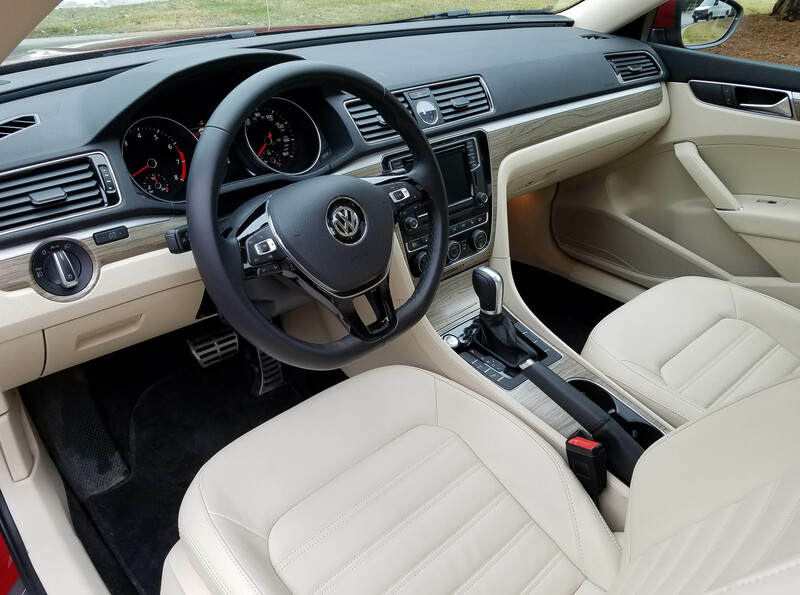 VW offers several additional trim levels, each adding more equipment to refine the car. The SE includes a fake leather interior to replace cloth, plus rear cross-traffic alert and blind-spot monitor. The V6 also is available in the SE. This SEL model with the sunroof, leather interior, premium audio system and smart trunk release starts at $33,995, plus $820 delivery fee, to hit $34,815. That’s still below the average cost of a new car. The Passat directly competes with the likes of Toyota’s top-selling Camry, Honda’s Accord and the Mazda 6, to name a few. All are great values and fine family sedans. The Mazda and the Passat are the most fun to drive. Hits: Power, handling, ride and a quiet interior, that’s hitting for the cycle. Well laid out dash, sunroof, D-shaped steering wheel, heated well-contoured seats, roomy heated rear seat and trunk too. Plenty of semi-autonomous electronics. Misses: Not much, a small touchscreen. Past reputation, and Consumer Reports, question reliability.